Although not all homes are graced with the presence of mezzanines—they are still a stylistic and architectural feature that can be slightly difficult to work around. Some of the benefits of mezzanines are that they add height, depth and an illusion of space to almost all homes they are present in. They also provide these quirky areas where you can have fun in deciding on how to use them—whether it be for workspace, play space or a relaxation area. 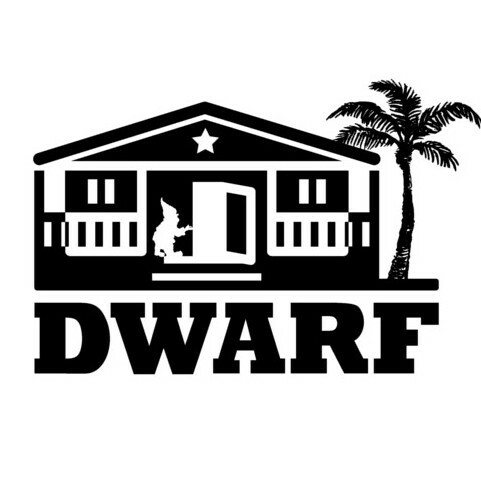 The disadvantage of mezzanines is their lack of functionality, depending on their set-up. With stairs, smaller floor space and usually a railing overlooking the ground floor of the house—it is difficult to decide what to do with them because typically they are so exposed to the rest of the house. In this Ideabook, we will explore six different styles of mezzanines and how they can directly impact the look of the rest of your home! A classic style mezzanine is typically a fully-exposed mezzanine with see-through railings and fully-carpeted stairs that leads to an open space that is also carpeted and dry-walled. One benefit of a classic mezzanine lay in its ability to provide your family with privacy and because of this privacy, it is possible to use a classic mezzanine to add a guest room! Other types of rooms that work better with privacy are study rooms and child’s play rooms! If you prefer more privacy, then get rid of the exposed railings you see here and instead, choose dry wall to create a barrier to separate the space even further! 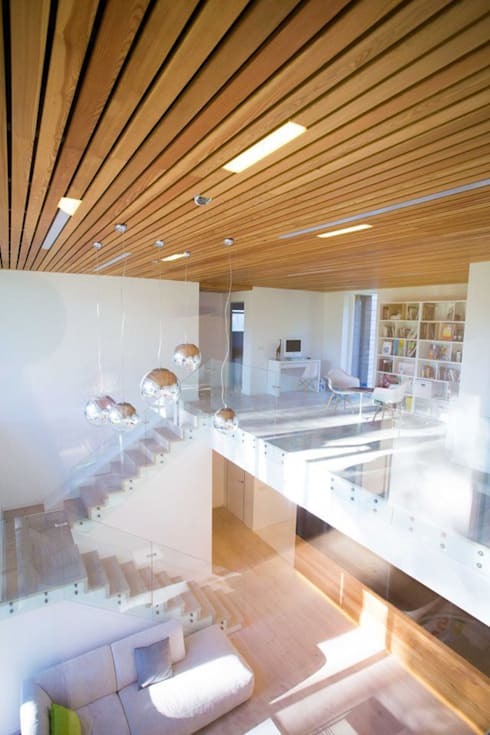 A minimal mezzanine can be really wonderful in its design qualities. As seen here, it can prove to be an inspiring and functional space, while maintaining a sense of belonging to the rest of your home. With an exposed staircase and a great bookshelf, this example shows the full-capacity to which you can use your mezzanine. Don't want your mezzanine to be so separated from the rest of your home? 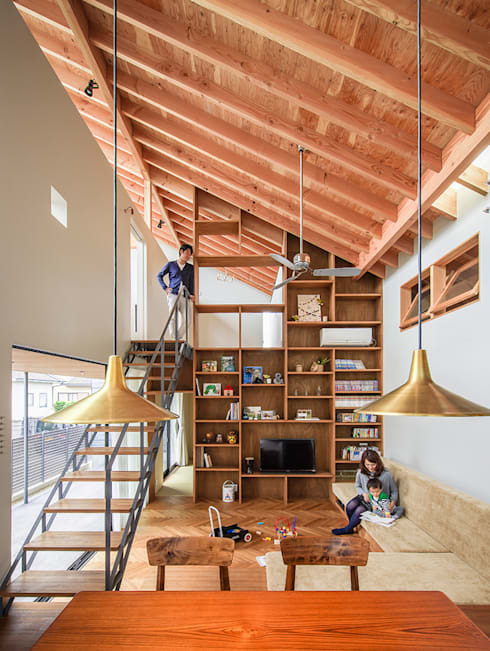 Do what this designer did and add a floor-to-ceiling bookshelf that stretches to the mezzanine so the space becomes instantly communal! If your home is more eclectic, then make your mezzanine eclectic as well. 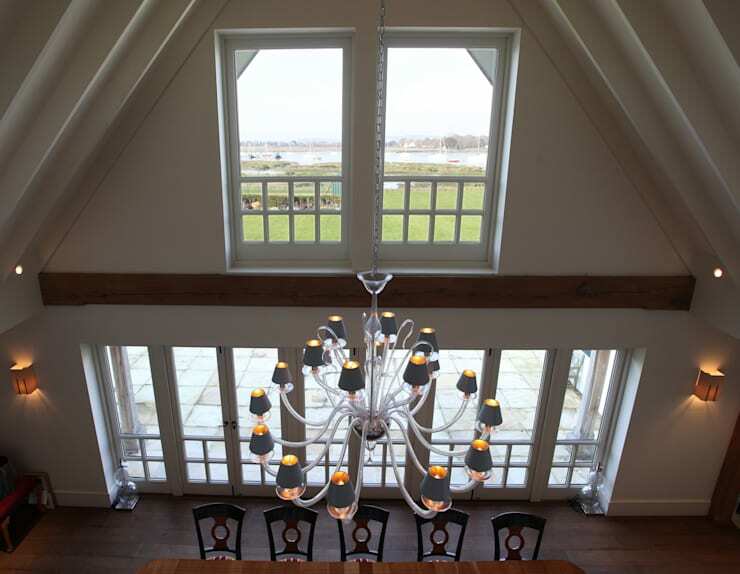 This mezzanine is great in that the glass flooring connects the mezzanine to the ground floor of the home and allows the natural light emitted from the skylight to seep down and provide lighting even to the ground floor! When it comes to decor and furnishings in an eclectic mezzanine—choose items that match the rest of your home and provide a sense of function—think about storage, workspace, or a space for your children to use while you have guests over. 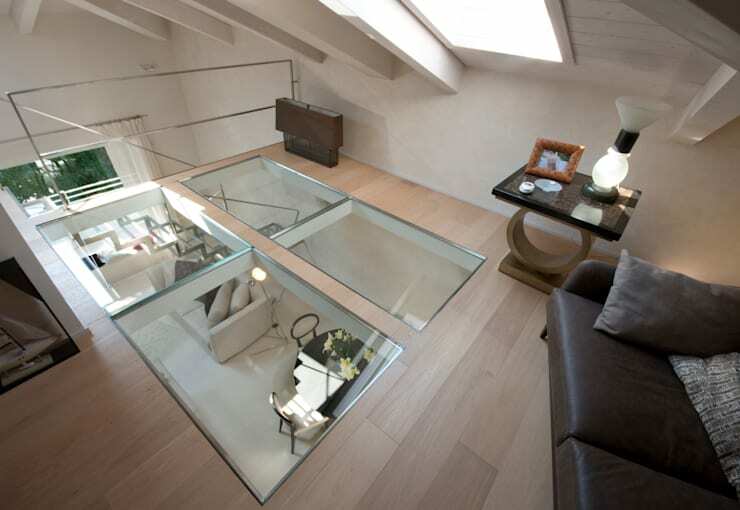 This mezzanine has all the components to successfully demonstrate an über-modern area! From the concrete floor with exposed bolting that connects the glass wall and stairs, to the metallic and reflective light fixtures, and the Eames-inspired chairs—this designer really nailed it. Although this mezzanine is quite exposed, the layout of the home and the double-staircase provide it with a feeling of privacy. It attracts a perfect amount of both artificial and natural light and with a work corner and floor-to-ceiling bookshelves it's the perfect space for someone looking to work a few hours or have a creative brainstorming session. This Scandinavian-style mezzanine is something different to think about depending on how it works with your home. If your style is modern or minimalist, then try Scandinavian furnishings and decor to maximise the minimalism of your home. For a light and fresh feel, choose lighter wall colours – neutrals and pastels – and keep the flooring a light-grain wood or laminate. For furniture, think about antique and vintage Scandinavian design. Like seen here, minimalistic chairs and tables in different shades of wood stain and pillow seats even create a semi-eclectic and childish feel to this mezzanine. For Scandinavian design you can leave the materials exposed – like how the ceiling timbers are exposed, as well as the metal encasing and handles. 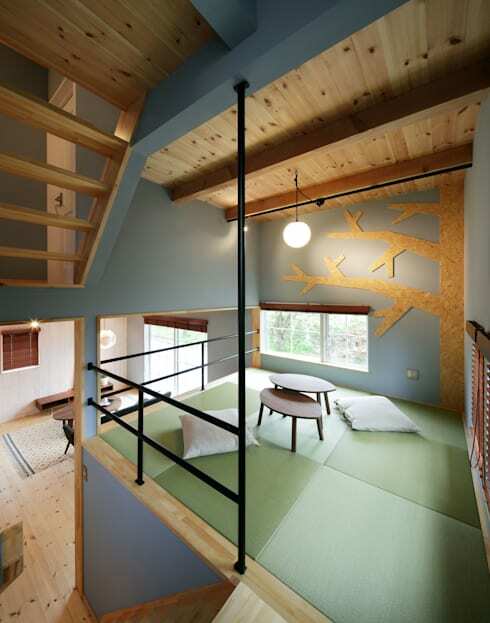 This particular mezzanine is designed by Dwarf, a Japanese-based design firm. Country and rustic mezzanines are the last design type we will talk about today. For the perfect, rustic feel—leave windows and hard wood timbers fully exposed. For a special look full of character, think about purchasing reclaimed wood from a local lumber yard or torn down buildings in your area. A rustic, if not eclectic, chandelier is perfect for a rustic mezzanine—maybe even think about designing your own for a great weekend DIY project. Let your rustic mezzanine be a place for entertaining, enjoying cocktails or for a relaxing reading nook once everyone has left! Do you have a mezzanine you've made to fit the rest of your home? Tell us what you did by commenting below!